After a successful meeting with Diane Rough, Depute Head from Kaimhill Primary this week, we have confirmed that another series of pupil visits will take place this year. 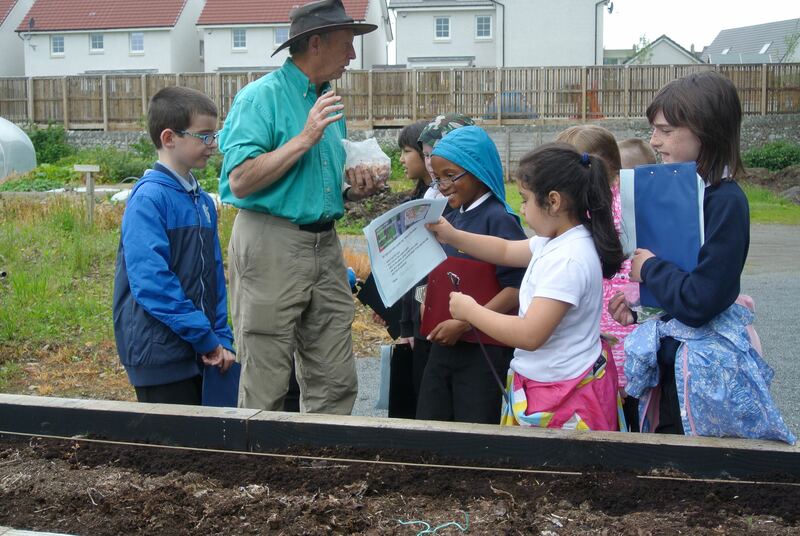 Last year we hosted Primary 2/3 visits to our site. I think we can say a good time was had by all! We hope to start earlier this year, in April rather than June and we plan one or two visits a week over a 10 week period. Details are yet to be confirmed, but we hope two Primary 3 classes will visit to look after the new Primary School Plot being developed down by the Community Orchard, taking alternative weeks. Stuart is in charge of getting the plot ready for use and Vinny has agreed to maintain it. In addition Primary 6 pupils will be building bird boxes and Bug Houses which we hope they will come on site to distribute to interested plotters. Other classes may come to follow some of the learning trails we developed and supported last year. All visits are planned for afternoons on Tuesdays, Wednesdays or Thursdays. We need to say a big thank you to Aberdeen Greenspace who have agreed to fund this collaboration over the next 12 months. Without their support the development of the new plot as part of our ‘outdoor classroom’ would not have been possible. Last season Stuart, Norman, Gill and Jacqui hosted all the sessions. In the coming year we will be pushed to meet all of the demand. If any plotters or volunteers could offer to help out for an hour or so on any days they would be most welcome. See any of the above if you can help.